Queen’s will be hoping to get their first victory of the season against Ulster rivals Banbridge in the big Division 2A Ulster derby at the Dub. 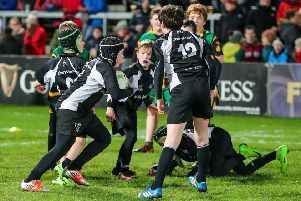 The students got a losing bonus point at Highfield last week while Bann were the only side in the division to get a bonus point win. Queen’s captain Alex Thompson knows Banbridge well. “I never played with them but I went to school in Banbridge (Academy) for five years and there was maybe a bit of pressure to go there this year, but I love playing for Queen’s and I’m absolutely relishing the opportunity to run out against a few lads that I know,” said the lock. “Banbridge had a very successful year in this league last season, following a very disappointing result last week and if we want to make a statement and are serious about moving up to 1B we have to do the business. Queen’s will have a number of their academy players like Thompson, Zac McCall, Nick Timoney and Marcus Rea available while Bann have Andrew McGrath starting. “Andy McGrath is coming in and it’s his first year with Banbridge and Queen’s have a few academy boys as well,” said Thompson. Banbridge won both games between the clubs last season but coach Dan Soper knows that means very little. “It’s last year and the guys will take confidence out of that. I’ll imagine Queen’s will be keen to put that to bed and rectify that from last year," said the Kiwi. Elsewhere, Malone host Highfield while Belfast Harlequins travel to Corinthians.